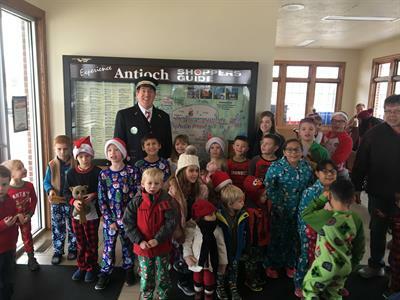 The North Pole Express Trains with the Village of Antioch are a huge success and we hope to see you again this year! 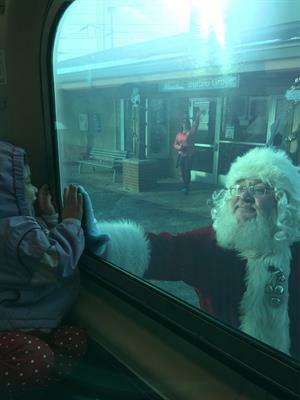 The 3.5-hour round-trip excursion comes to life as the train departs the Antioch Metra Station for a journey to the "North Pole". Children will join in and sing as our conductor goes around checking each of them in. Children's faces show the magic of the season when the train arrives at the "North Pole". Santa will join the group in between keeping an eye on the elves that are busy making the toys for Christmas. Christmas carols will be sung as they return back to the Antioch Metra Station. Children and adults are encouraged to wear pajamas to this event. to get on the Train. Tickets are sold in PERSON only. No tickets will be sold online.